There is so much happening around here right now...vacation, birthdays, mothers day, work events...we will see if I can keep up. I am currently sitting here eating a leftover pac-man cupcake and drinking a diet coke out of a pink crazy straw while importing photos from last night's epic (or should i say tubular) surprise 30th birthday party for Andrew. How better to celebrate turning the big 30 than to turn back time to the year he was born. Family and friends wore their best 80s ware and we partied like it was 1984 all night. Details to come. 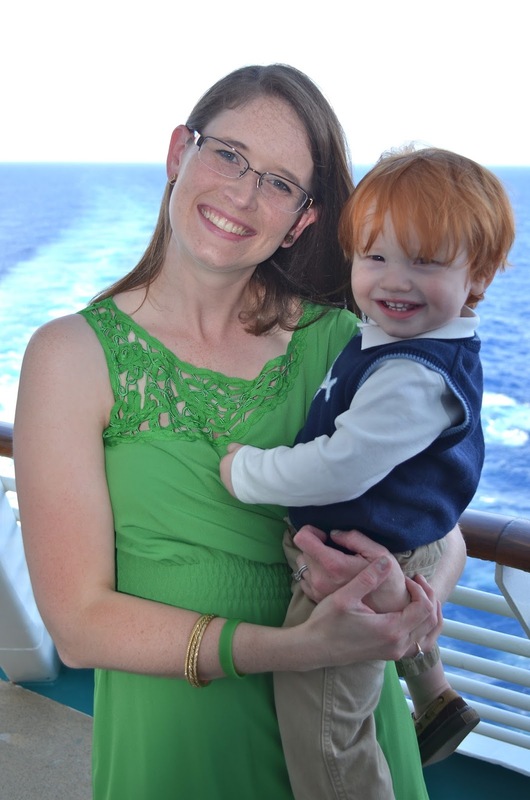 In the meantime I will keep going with the cruise recap and photos. Day three of the trip (day two onboard the boat) was a day at sea. I love sea days because you don't have to get up and ready to go ashore and can spend the day exploring the boat or just chilling out. We did have breakfast reservations for 8 am for a Dreamworks character meal. The menu was all DreamWorks themed which was fun and we could order whatever we wanted from that or go up to the buffet that was set up in the dining room. They brought the characters out one by one and had them go around the room interacting and taking photos with each table. The next character would not come out until the previous one finished making the rounds which made the meal a little too long...if you wanted to meet all three characters. We left after two, so I don't know who would have come out to visit after Fiona and Puss. We wished they had brought them all out and let them stagger throughout the room at the same time. But it was still fun and we had a good breakfast. After breakfast we went for a dip in the baby splash pool. It was a nice little space with one little fountain. Adequate for babies, but Perry was not alone in wanting to go play in the bigger kids splash zone nearby and we had to keep pulling him back to the baby pool. He had fun though splashing and running around in the few inch deep water. After P had enough of the water we hung out on the pool deck a little while and popped some bubbles. 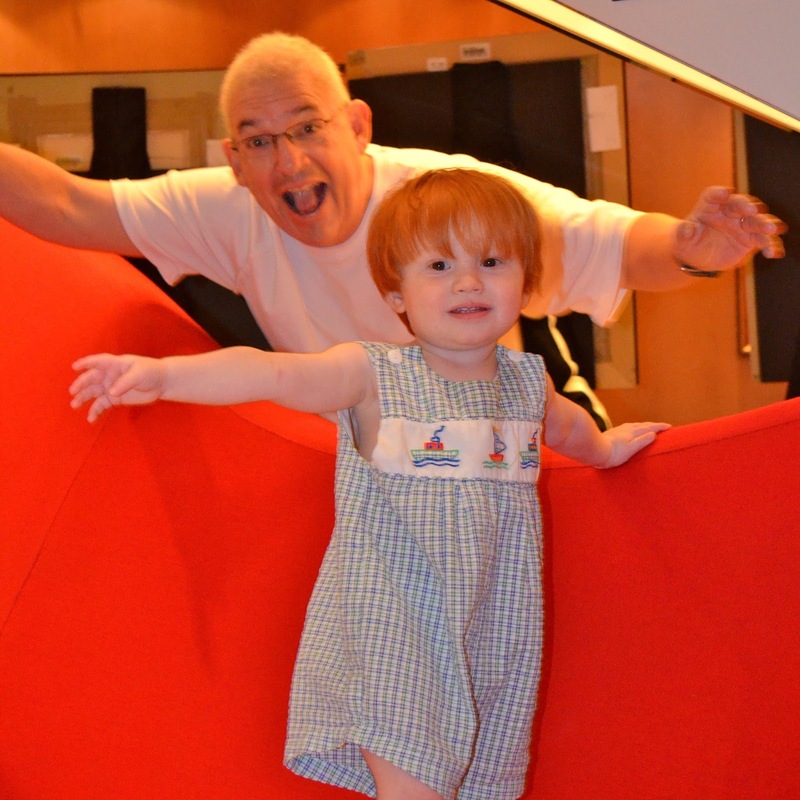 Then we went up to deck 14 and played in Cloud Nine, a little room where they put out mats and toys and you can go have free play with your toddlers. The views from up there are spectacular and it was a great place to go to escape the sun and heat. 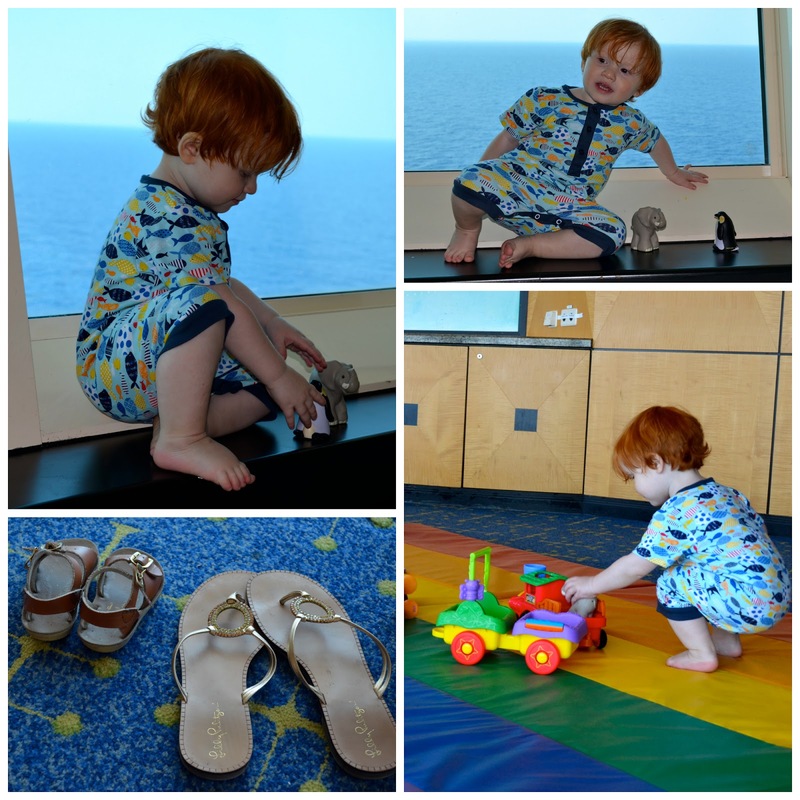 P was looking super cute in his little fishy zutano romper. 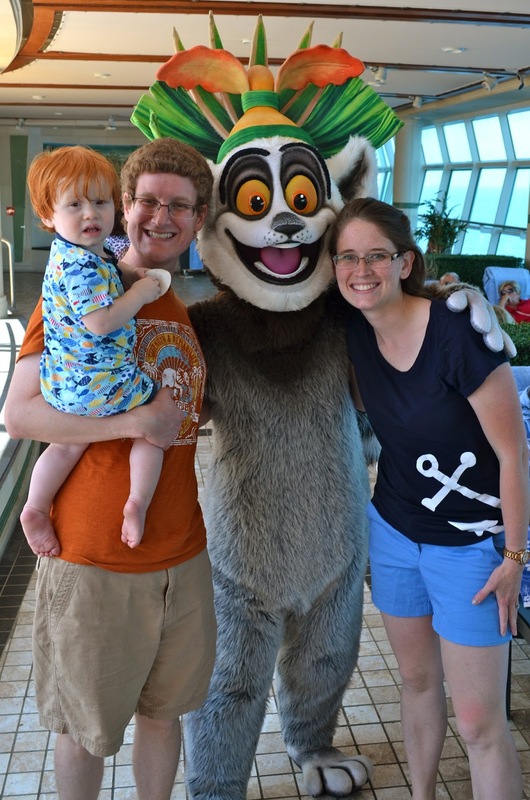 On our way back downstairs to our room for naptime we found King Julien by the pool and stopped briefly for a picture. It had been a fun filled morning and P was ready for a long nap. 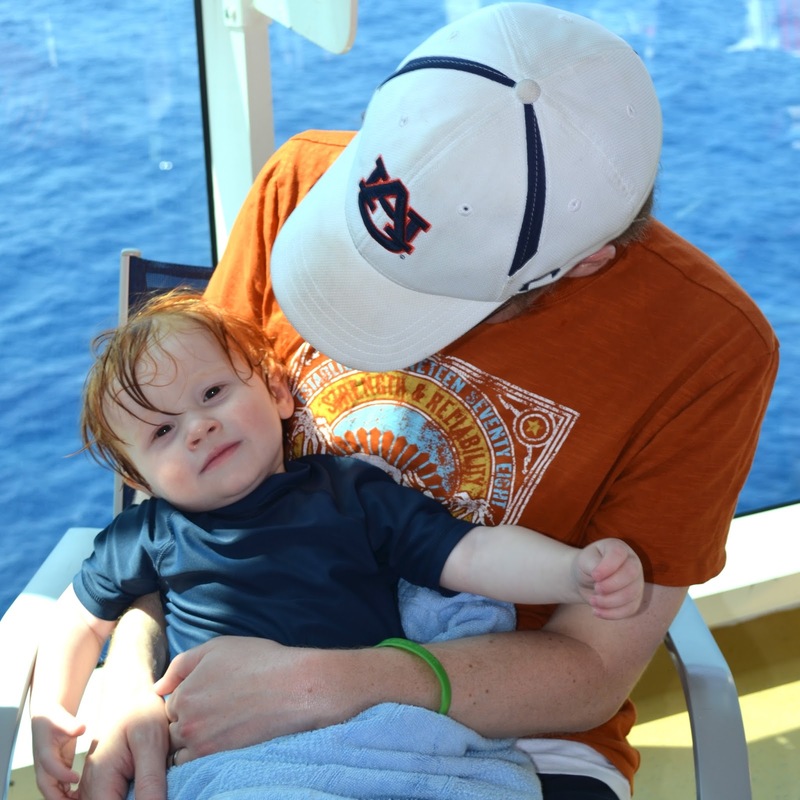 Andrew relaxed on our balcony while P slept while I went for a treadmill run at the gym and wandered around the ship. I didn't want to go back in the room for fear of waking a sleeping baby so I settled in to a chair with a nice view, a diet coke and some reading material. 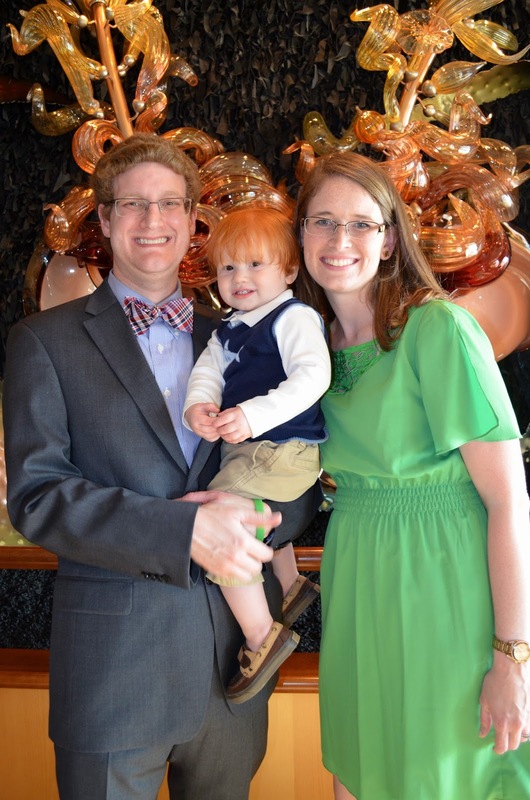 We finally had to wake Perry up to get ready for dinner...because it was formal night and we had to get all gussied up. 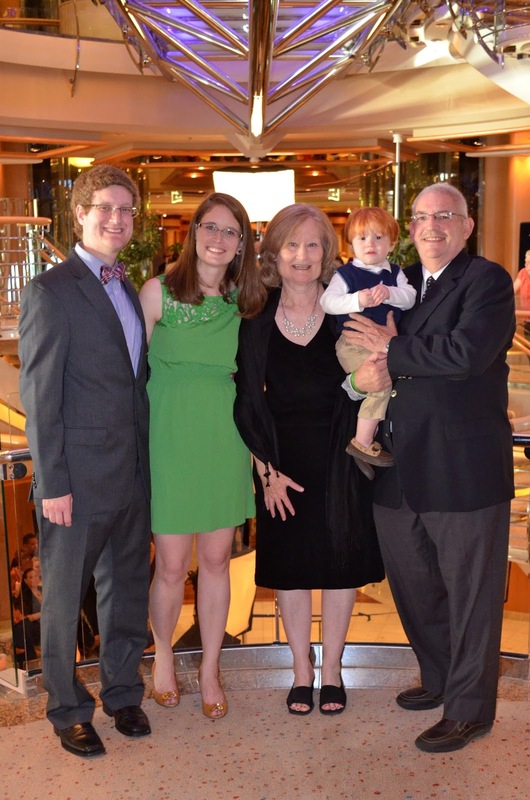 We got ready and met up with Granna and Grandaddy for some pre-dinner photos. 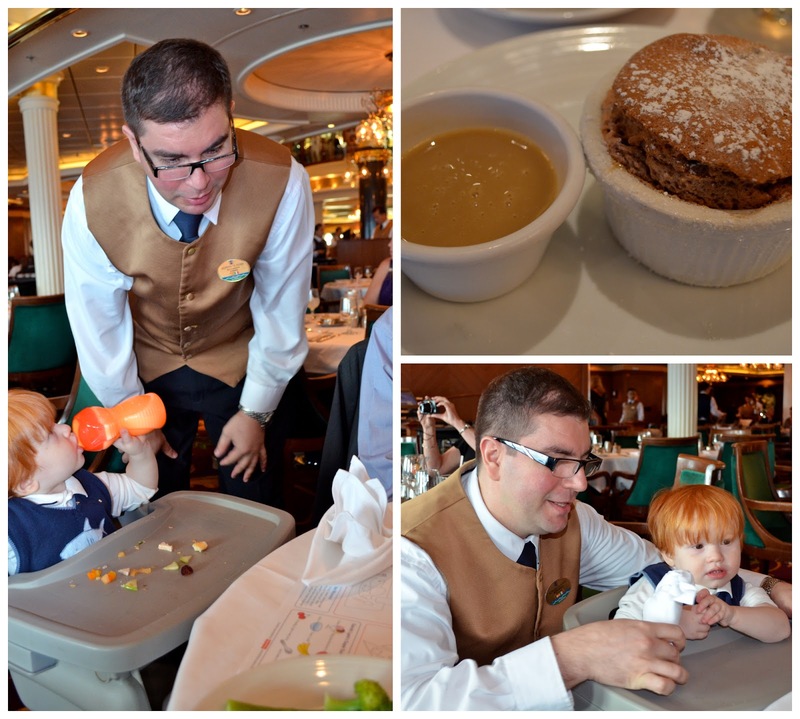 Perry was entertained at dinner by our waiter's napkin folding skills. And for dessert, I had this amazing expresso soufflé. Yummy! 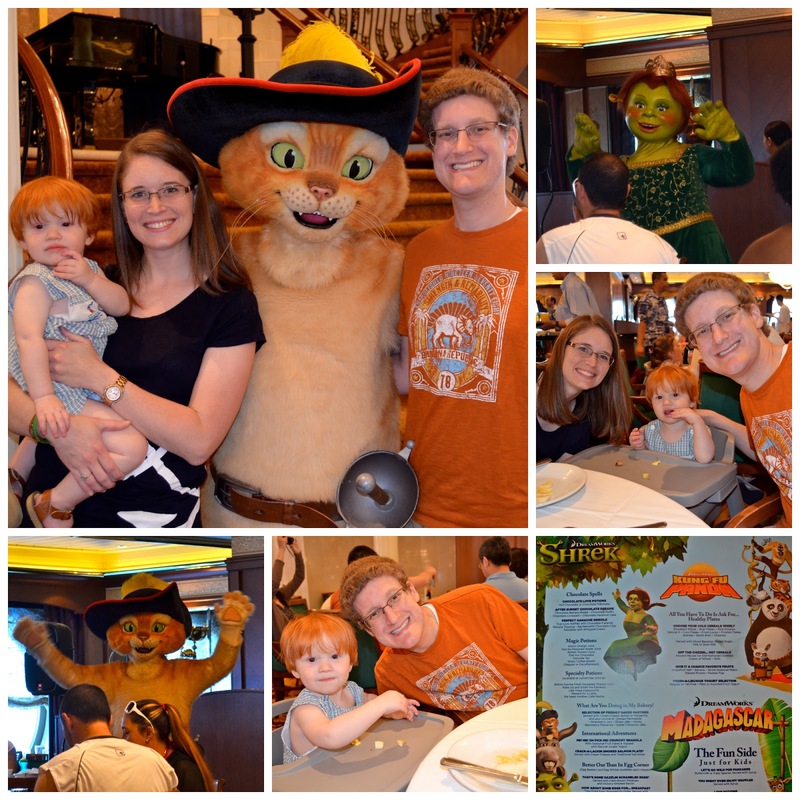 After dinner we went for a walk down the Promenade and got to meet Shrek and Fiona. Goofballs! Then we went down to the Catacombs, this kind of dark and creepy lounge that is probably a raging party place in the middle of the night, but at 8 pm it is a family friendly dance party. 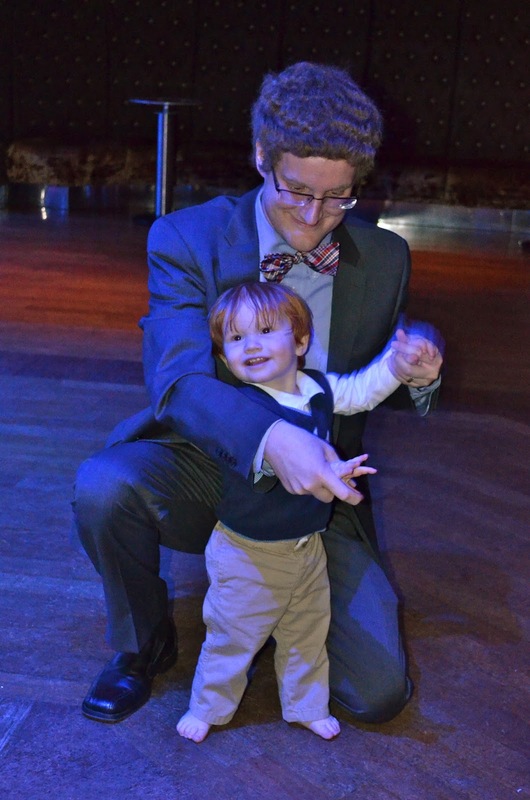 There is a big dance floor where Perry could run around and show off his moves. There weren't many people there so there was plenty of room to play. King Julien even stopped by to dance with us. Whew. It was quite a busy day for a day at sea. So many fun things to do...definitely not a boat to get bored on. We eventually made it back to our room (it was actually only like 8:30 at this point) and headed to bed. Perry was thrilled to see our cabin steward had left us a towel puppy dog (that matched his puppy dog pjs) during turndown service.